Today we are announcing the randomly selected winner of the MFT 10th Birthday Celebration Bonus Challenge! But before we get to that, check this out! There's still time to participate in Color Challenge 49! Remember, you don't have to have the EXACT colors to play. Just use colors inspired by the ones you see below. Vicki Parson went MFT challenge crazy with this great card. Of course, the colors are from Color Challenge 49, but she also submitted this to earn her Camp Create — Fantastic Foiling badge, Sketch 289, as well as our MFT 10th Birthday Celebration Bonus Challenge. Talk about killing FOUR birds with one beautiful stone! 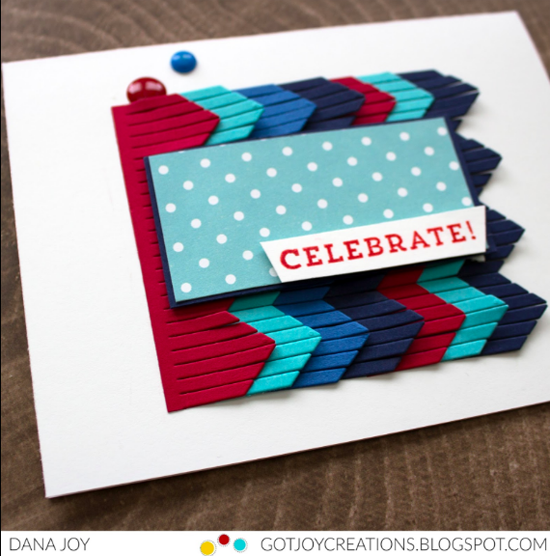 Dana Joy's trendy design fulfills Color Challenge 49 beautifully as well as Sketch 289. I absolutely aDORE her use of the Chevron Fringe Die-namics. 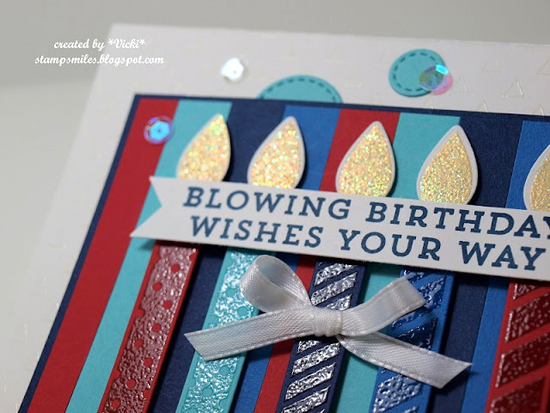 Tina Pavlovic created a 10th birthday card featuring foiling from Camp Create Session Two and stamps from the Beary Special Birthday stamp set. 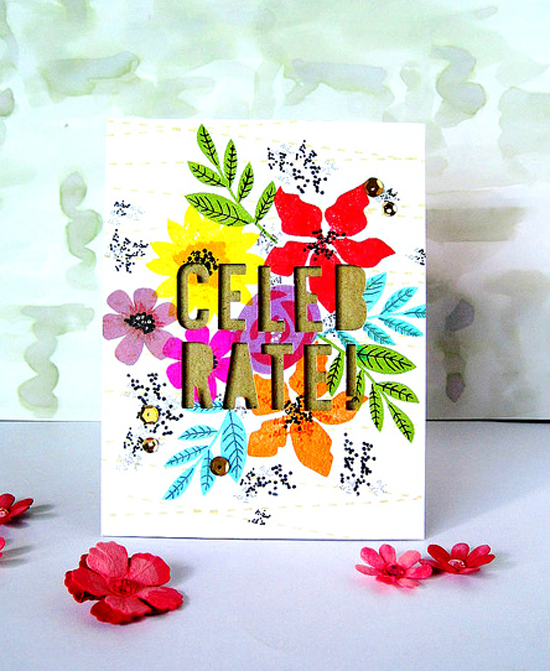 Ashwini emulated this card that Yoonsun Hur created using ten flower and leaf stamps from the Modern Blooms stamp set and the sentiment includes 9 die cut letters and an exclamation point to equal another 10. Becky Noelle's design features a flamboyance of 10 fantastic flamingos! 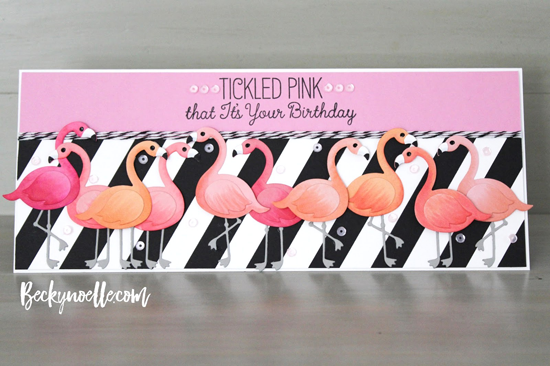 She used the Tickled Pink stamp set and Flamingos Die-namics to create this totally fun and summery design. To see the rest of the entries, be sure to go HERE. Some really inspiring stuff! Congratulations, Nicole! You've won a $20 gift voucher for use in the My Favorite Things Boutique. It should appear in your email shortly. Thank you to ALL of you for making our 10th Birthday SO much fun! And we can't wait to see what you create in our upcoming sketch and color challenges! SQUEAL!! I just loved going through my feed reader this morning and seeing you've put my card! :) Honored! I have really enjoyed seeing all of the awesome creations for these challenges this month!! Everyone is so creative!! I have one last card to finish up for the camp, but big congrats to the winner for the 10th birthday challenge!! Yay!! I love it! Hooray for your fantastic card! Yippie!! Thank you for featuring my card here!! Thank you so much!! Wauu.Thank you so much for featuring my card !!! It means a lot to me..Congratulations to Nicole!! Hugs from Sweden!! Oh wow! Such a surprise! THANK YOU so much! I love your stamps and dies! I can't even with you Susan. LOL. Thank you so much for featuring my card. Hope you watched the tutorial on how you can use the die in two ways. Thanks again! !